Glam Morena: Wet n Wild Mermaid’s Cove Collection. Wet n Wild Mermaid’s Cove Collection. 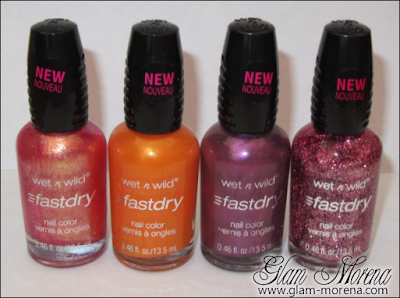 I introduced you to part 1 of the Wet n Wild Summer 2011 collection, which was the Go For the Gold Collection. The other two consist of two nail polish collections. One of them being the Mermaid’s Cove Collection. 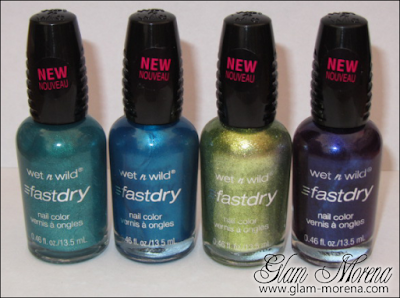 This collections features eight limited edition Wet n Wild Fast Dry Nail Colors. Mesmerize with one enchanting curl of your finger! Splash into the season’s most hypnotic colors and effects! These enchanting nail colors come in our 60-second Fast Dry Nail Color formula, perfect for the summer! Waves of Enchantment, Magic Trident, Sea of Dreams, Atlantis. Diving for Pearls, Stream of Wonder, Ocean Grotto, Sea Witch. Swatches of Wet n Wild Mermaid’s Cove Collection! What's your favorite shade from the Mermaid’s Cove Collection? Very pretty. Ive seen these poppin up randomly but not the entire set I dont think. I love the colors very pretty and vibrant. So pretty, I really like the orange one! Atlantis & Sea Witch are pretty!